Ever since the Roth IRA was introduced—way back in 1998—financial planners have been bombarded with questions about this retirement planning tool. Can I covert a traditional IRA to a Roth? If I can, should I? And if it is a good idea, when should I convert? There’s no blanket answer to all of those questions. To a great extent, the decision to convert or not will depend on your particular circumstances. Still, there are several key factors for you to weigh, and general guidelines based on the current tax landscape. If you have a traditional IRA, all of the distributions you receive (to the extent that they represent deductible contributions and earnings) will be taxed at ordinary income rates. Currently, the top tax rate on ordinary income is 39.6%. In addition, a 3.8% Medicare surtax applies to the lesser of your “net investment income” (NII) or the amount of your modified adjusted gross income (MAGI) that exceeds $200,000 for single filers and $250,000 for joint filers. Although IRA distributions don’t count as NII for the surtax calculation, they can still boost your annual MAGI. As a result, you might pay an effective federal income tax rate of 43.4% on all or part of your IRA distributions. Another important distinction is that you must begin taking required minimum distributions (RMDs) from a traditional IRA after reaching age 70½; in contrast, there are no mandatory lifetime RMDs with a Roth. This can be a crucial advantage if you won’t need IRA funds in retirement. The main stumbling block is that a conversion is taxable at ordinary income rates just as if you had withdrawn the amount as a regular distribution. That means you need to examine at least four key factors in the conversion decision. 1. The tax rate differential. Compare your current tax rate with the tax rate bracket you expect to be in when you withdraw funds from your IRA in retirement. The lower your current rate as compared to the expected retirement rate, the greater the incentive to convert now. Conversely, you may not want to convert if your current rate is much higher than your expected rate during retirement. 2. Availability of non-IRA funds. 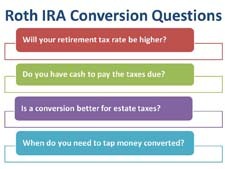 One frequently overlooked Roth conversion question involves whether you have funds on hand to pay a significant conversion tax. If you’ll be forced to siphon funds from your IRA to pay the tax bill, you’re diluting the future benefit of a conversion. But a conversion now could make sense if you have money in other accounts to cover the resulting tax. 3. 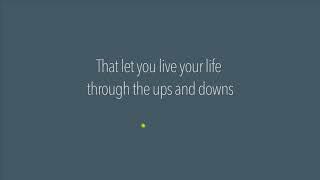 Funds you have to pay living expenses. Will you need to begin drawing down IRA funds within the next few years? If you have to tap a Roth right away, you may not realize the full benefit of the tax-free distributions. If you can keep your IRA intact for a longer period, a conversion may be more attractive. 4. Time horizon. 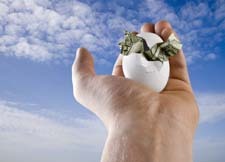 A Roth conversion may appeal most to middle-aged investors who are still several years from retirement. If retirement is imminent or you’re already retired, that may reduce your incentive to make a conversion. Nevertheless, switching to a Roth may still be reasonable if you’re older, especially if you’re looking for ways to preserve assets for your heirs. Focusing on these four factors, crunch the numbers to see whether a Roth makes sense for your situation. One or more factors may count more heavily for you than others do, and we can help you do a detailed analysis. Finally: Don’t worry about pulling the trigger on a conversion and then regretting your decision. You can “recharacterize” a Roth IRA as a traditional IRA if you make the decision in advance of the tax return due date (plus extensions) for the year of the conversion.